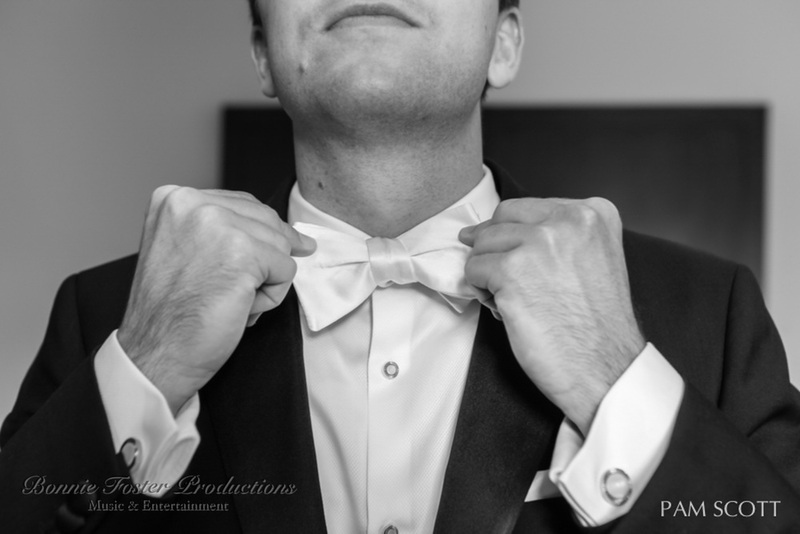 The "coolest black-tie wedding ever" is currently featured on the front page of Style Me Pretty. 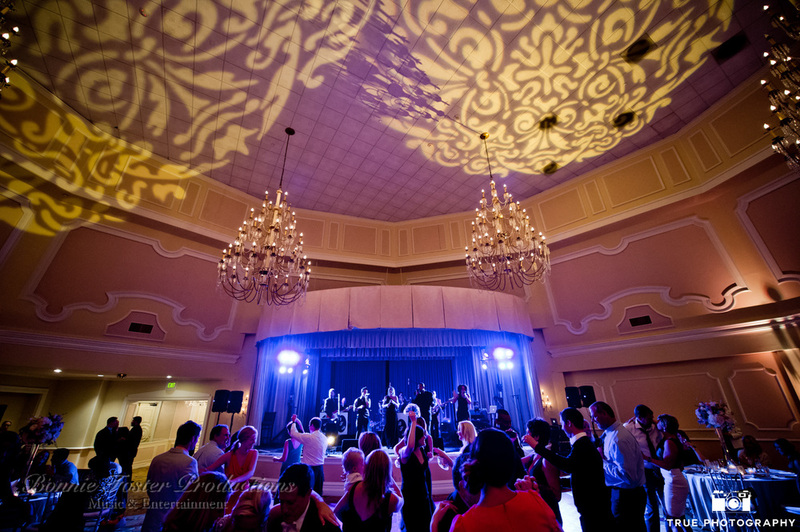 The bride Abby, a NBC creative director, comments, "At the top of our list of must-haves for the big day was an amazing band that would get – and keep – people out of their seats and on the dance floor the entire evening. 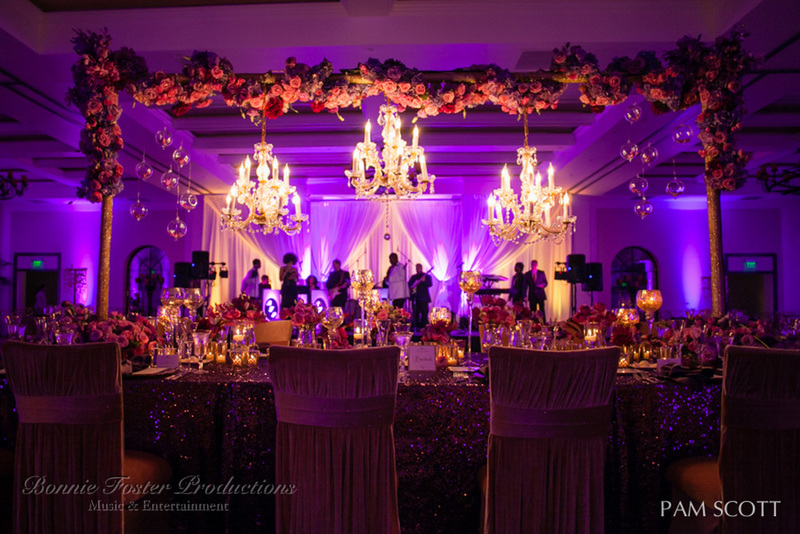 For us, that meant bringing world-renowned, San Diego-based Bonnie Foster Productions to the Arizona Biltmore. 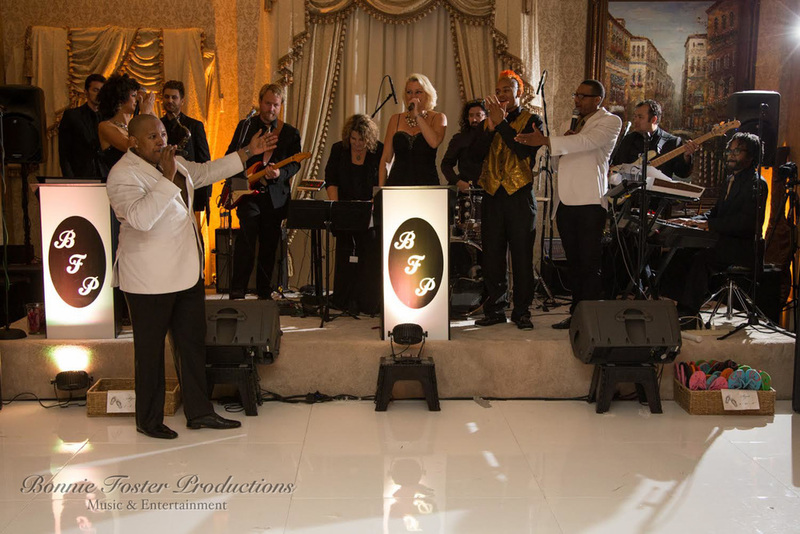 Led by Bonnie Foster herself, the 10-piece band kicked off the evening with Bruno Mars’ Uptown Funk (a personal favorite) and later brought down the house with Beyonce, Motown, and a Michael Jackson medley that our guests are still talking about months later". 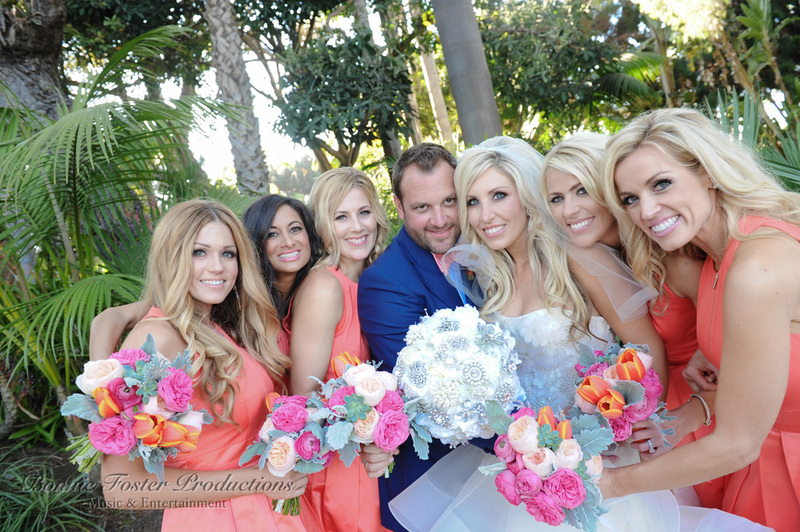 Gary & Allyson's wedding reception was celebrated on the croquet lawn at the beautiful Rancho Valencia Resort and Spa. This was one dreamy bohemian-chic wedding, with a peaceful, fall feeling. BFP warmed up the night with old and new hits, later topped off with Armenian tunes to start the traditional festive dancing. It couldn't have been a more heartfelt experience. 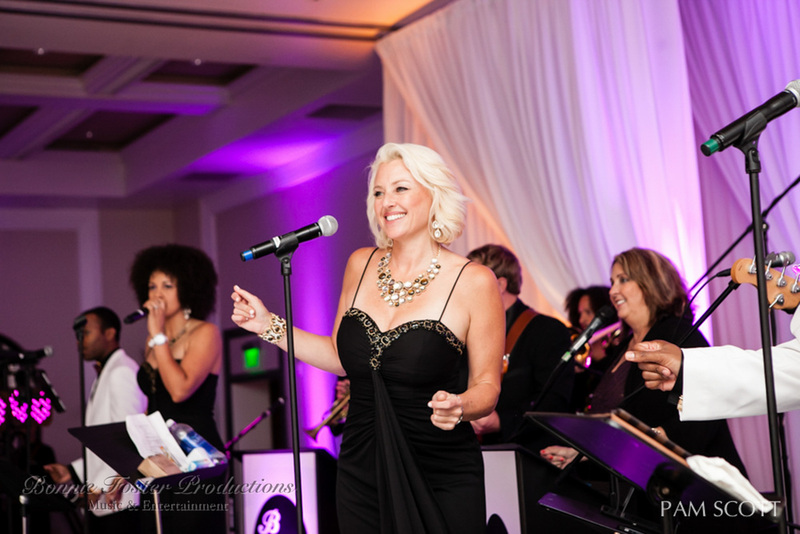 Thank you Pat, Viola, Barbi and Greg and the amazing Boys and Girls Club of Carlsbad for putting on such a wonderful Fly Me To The Moon Gala at the Omni La Costa Resort and Spa and raising money for the kids! Shout out to all of the fabulous staff at La Costa led by my friend Jessica B, and to the talent on stage who gave their all! Well done and great teamwork. 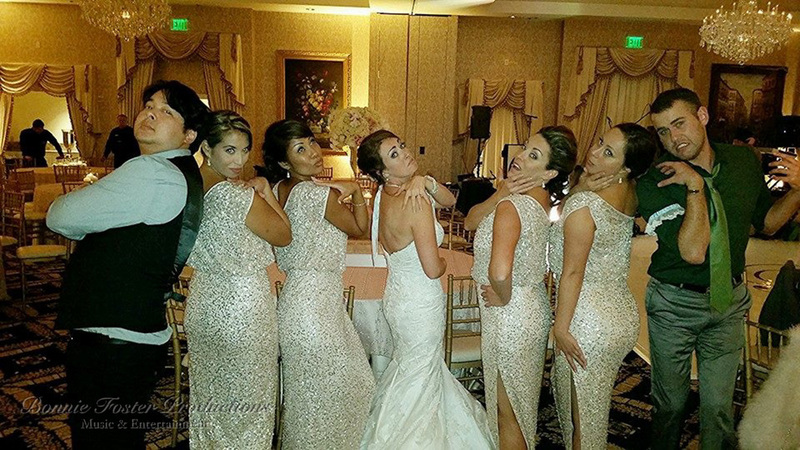 Abbey & Mark sparkled at the Arizona Biltmore where close family and friends celebrated their matrimony. A&M manifested that love in heartfelt and well coordinated dance moves to their favorite songs! Congratulations you two! 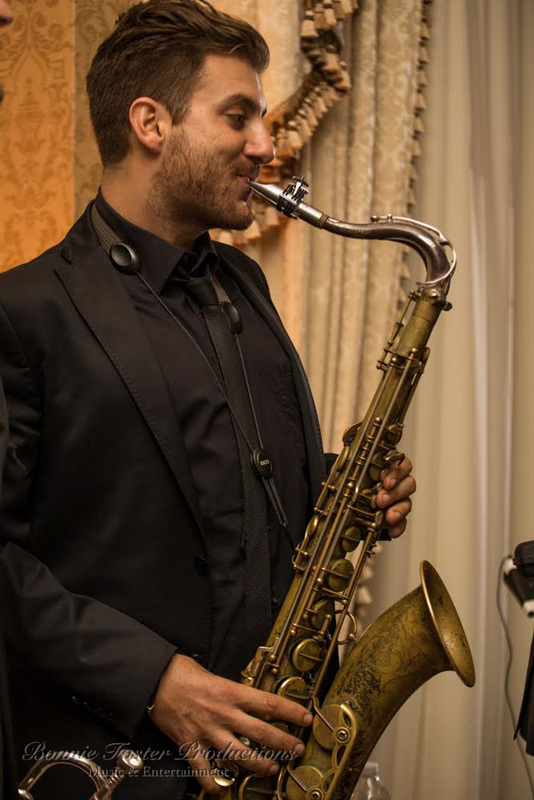 Style of Music: BFP set the tone for this chic corporate event by infusing smooth jazz instrumentals and soft solo performances to enhance the elegance of the picturesque courtyard scene. 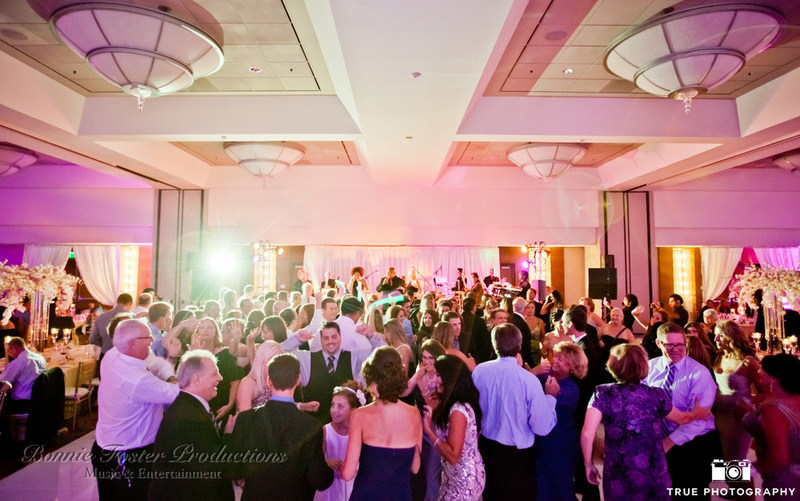 The guests could not hold back and by the end of the night it turned into a spontaneous dance party. Such sophistication and talent, both on and off of stage - what an impressive 50 years! 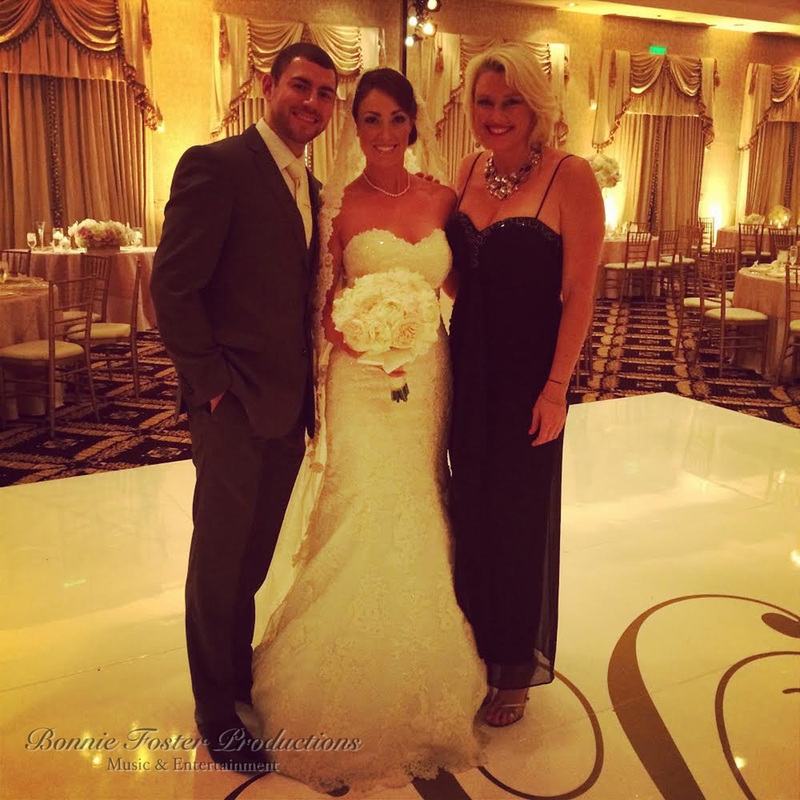 Style of Music: The ceremony, cocktails and reception entertainment for this gorgeous wedding was provided by yours truly…and we are truly grateful! While the trio of string musicians serenaded ceremony attendees, our romantic Latin Groove™ Trio complemented the Mediterranean-style theme on the high terraces of the Ritz for cocktail hour. 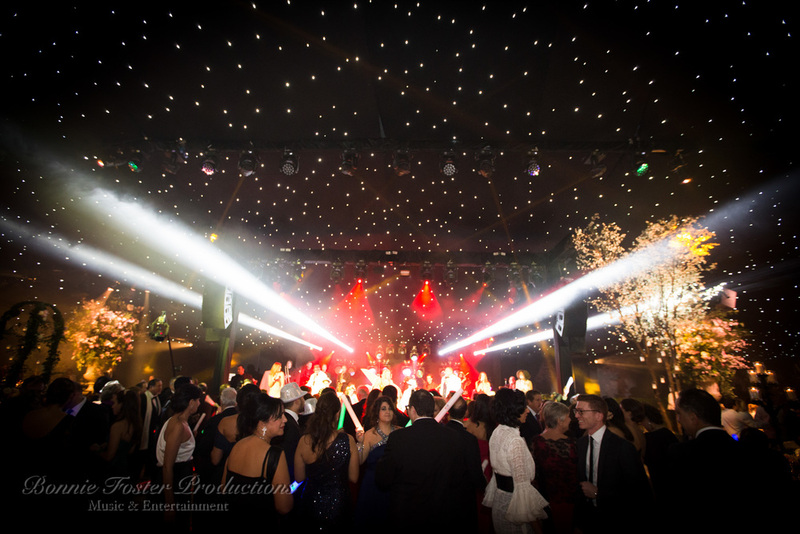 This elegant celebration was complimented by a five-star performance featuring iconic American classics with a dash of pop hits that transformed the dance floor into a lively multi-generational festivity. 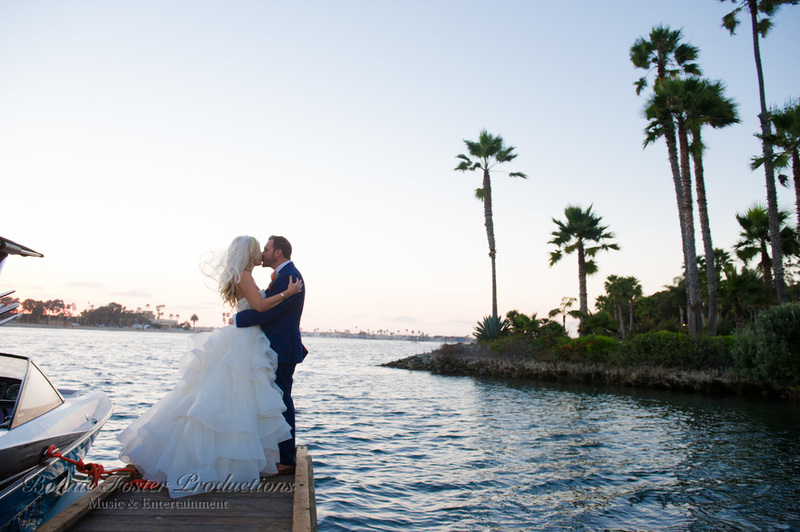 Darielle Meyerowitz and Alan Deicas were married on Sunday July 19, 2015 at Coasterra on Harbor Island, the beautiful, new addition to the Cohen Restaurant Group. Darielle is South African and she loves Lionel Ritchie. BFP's 16 piece band did renditions of some of his greatest hits like All Night Long with a fabulous horn section. Alan's family is from Mexico. During the traditional hora dance the groomsmen threw Alan five feet high up in the air with a sheet. Both bride and groom are both the last children in their families to get married so BFP did the traditional Mazinka dance honoring both sets of parents. 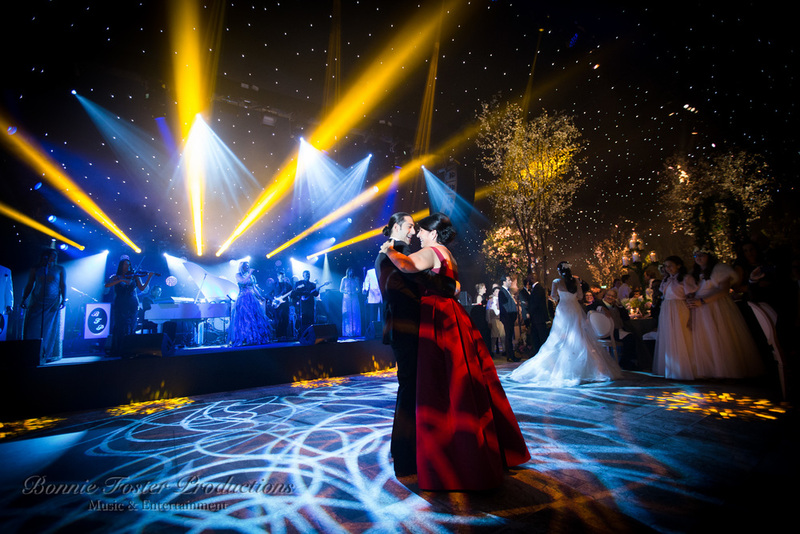 Not even the unusual San Diego weather, thunderstorms and rain pouring down from the sky, could affect the tremendous amount of energy and fun that was generated by the guests' dancing and their exuberant response to the live music. 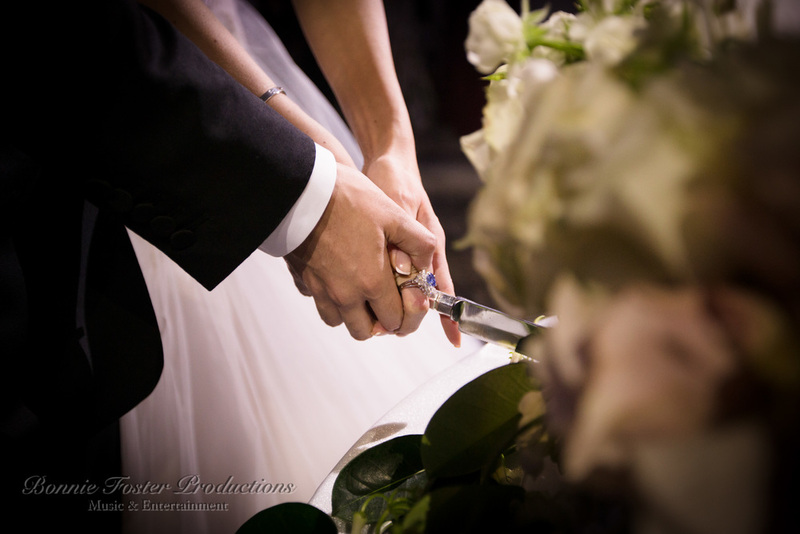 Christopher & Angeline exchanged vows at the Church of Nativity in a traditional Catholic service on June 20, 2015 in Rancho Santa Fe, CA. 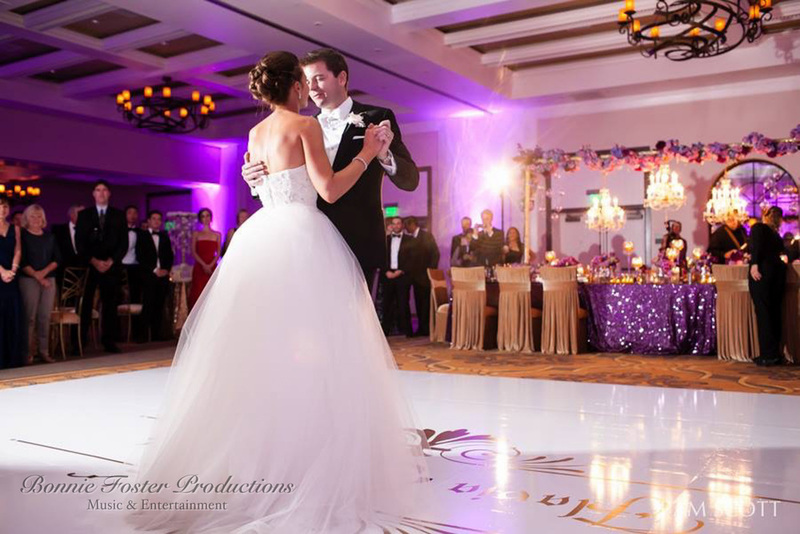 The happy couple and their 160 guests continued the festivities at the iconic Hotel Del Coronado on Coronado Island. 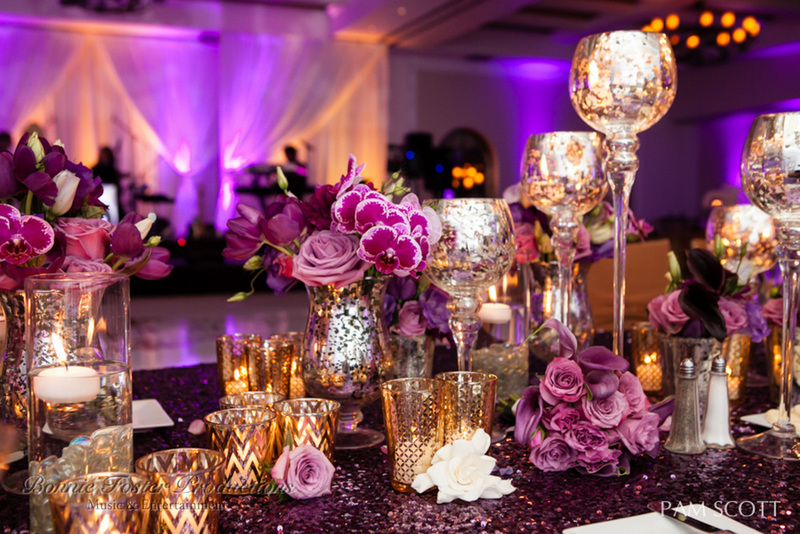 With panoramic ocean views drenched in colors of blush, champagne, ivory and gold, the wedding reception in the Grand Ballroom was the perfect setting for a sunset celebration. 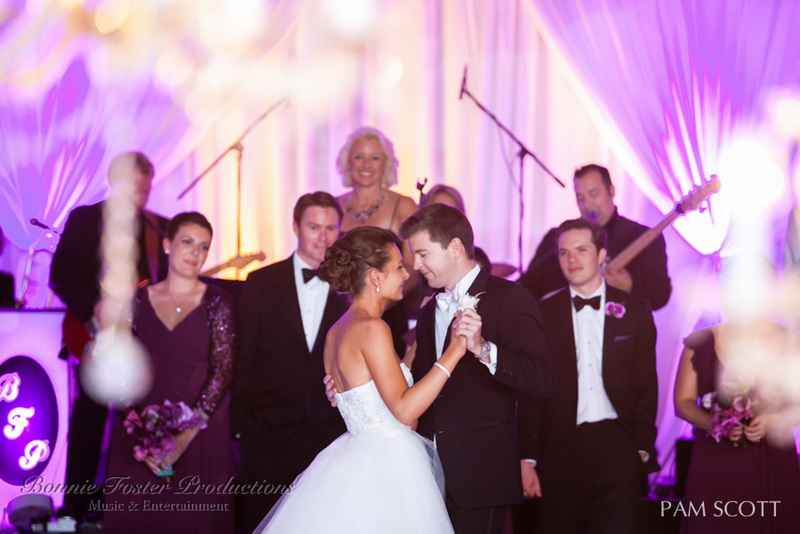 Our 14-piece wedding band and DJ Hybrid serenaded Christopher & Angeline as they charmed everyone with a beautifully choreographed 1st dance to “All of Me” by John Legend. 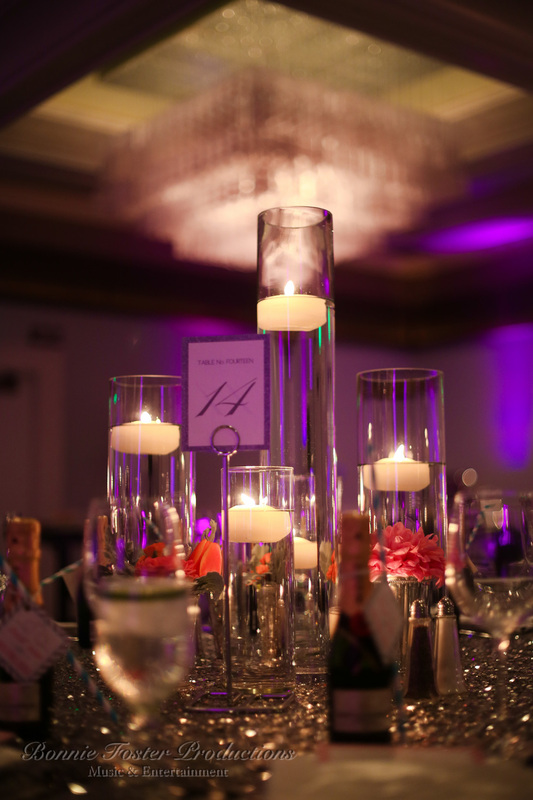 Family and friends quickly joined them on the dance floor, and guests got to "Shut Up and Dance," feel the "Blurred Lines" and "Get Lucky" before the first course. For dinner, we slowed it down to a few Sinatra favorites bringing the vibe back up between courses to a fast moving Motown Medley. 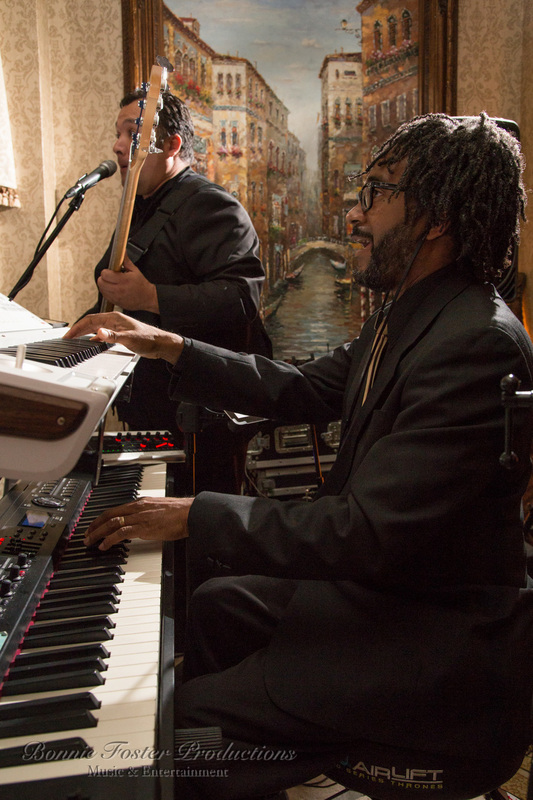 The band kept surprising this hip crowd with top 40 hits while mixing in Grammy Award-Winning favorites of all genres and eras. The evening ended with the most current club mixes by our very own BFP DJ Dr. J. 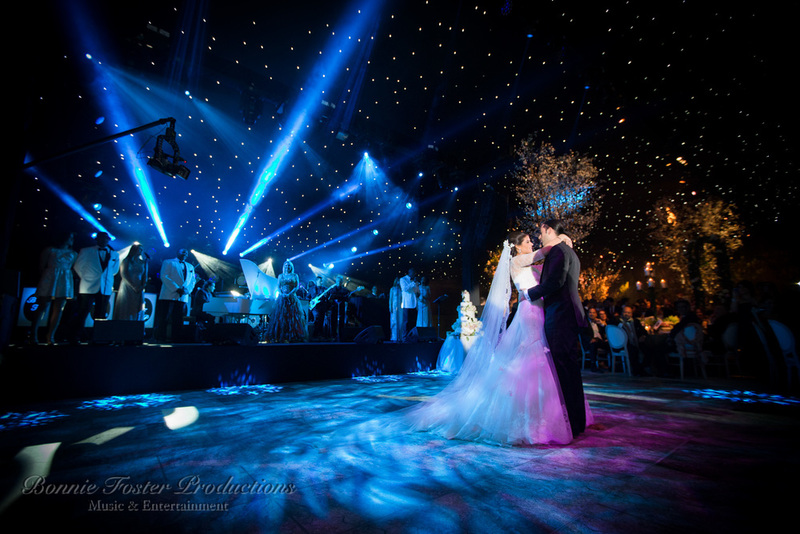 Check out these Video Highlights of Christopher & Angeline's Wedding Reception! 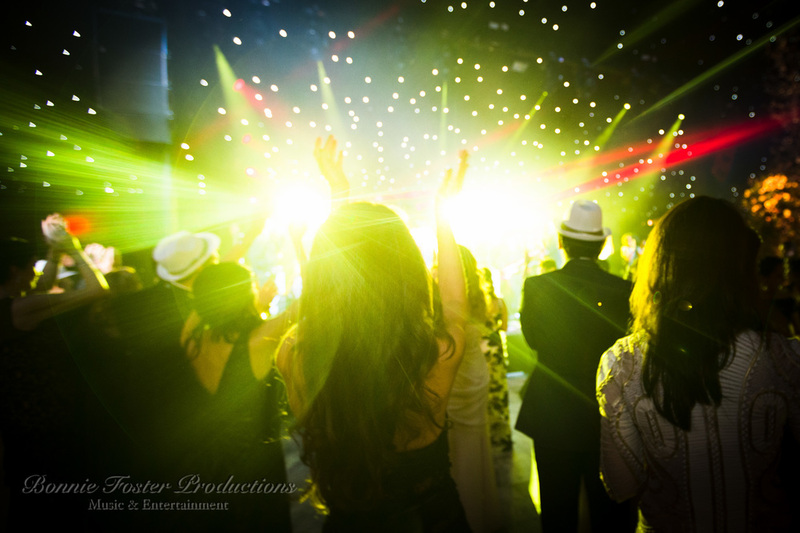 Event Coordinator: Caitlin Lowry - Creative Affairs Inc.
Go backstage with Bonnie Foster as she takes you for a behind-the-scenes look at a Bonnie Foster Productions exclusive private party, live music experience at the 5-Star SLS Hotel in Beverly, Hills, CA. The evening kicked off with beautiful dinner music with violin, piano and flute and featured talented vocalists performing everything from Italian Opera to current hits from Sam Smith, John Legend and many other great artists. The night really started to heat up with Hot Latin Salsa Dancers igniting the dance floor to the Enrique Iglesias smash hit “Bailando” and the upbeat latin song “Salome.” Guests of all ages packed the dance floor and got “Happy” with Pharrell and had the “Time of Our Lives” with Ne-Yo and Pitbull. BFP’s dance party continued as the full horn section got “Uptown Funk”-y and rocked the house with an impromptu blues jam on the dance floor at the end of the night. Thanks to everyone who made this a spectacular birthday celebration! 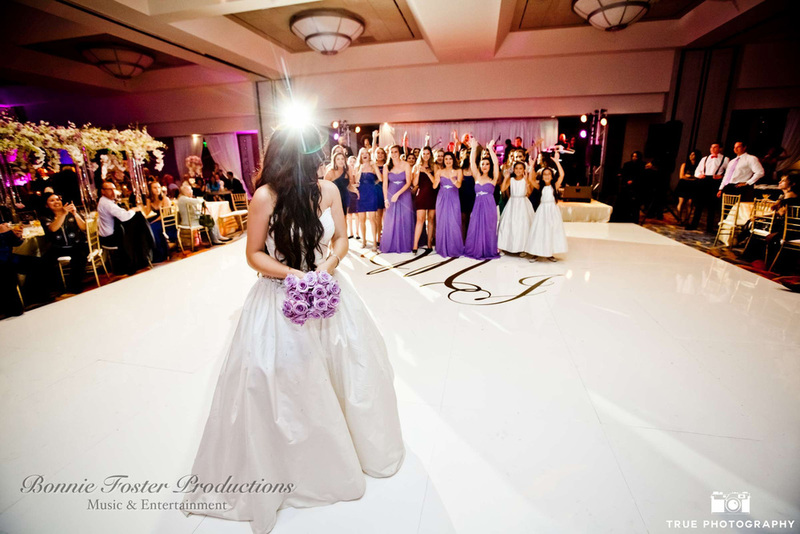 On December 20, 2014, we helped Aviva & Daniel celebrate their big day with a 21-piece wedding band followed by a late-night DJ set at the Omni La Costa Resort & Spa in Carlsbad, CA. 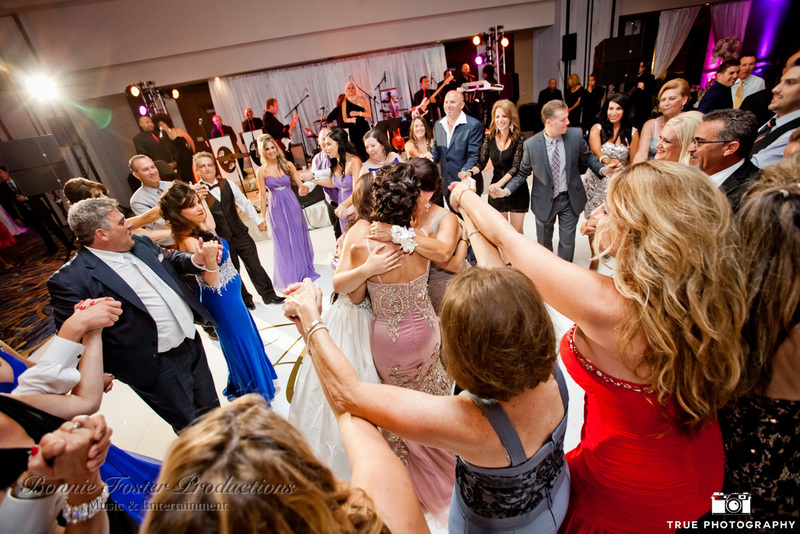 We started with an energetic 30-minute Jewish Hora and kept the dance party going all night with classic R&B jams, modern dance hits and latin dance grooves. 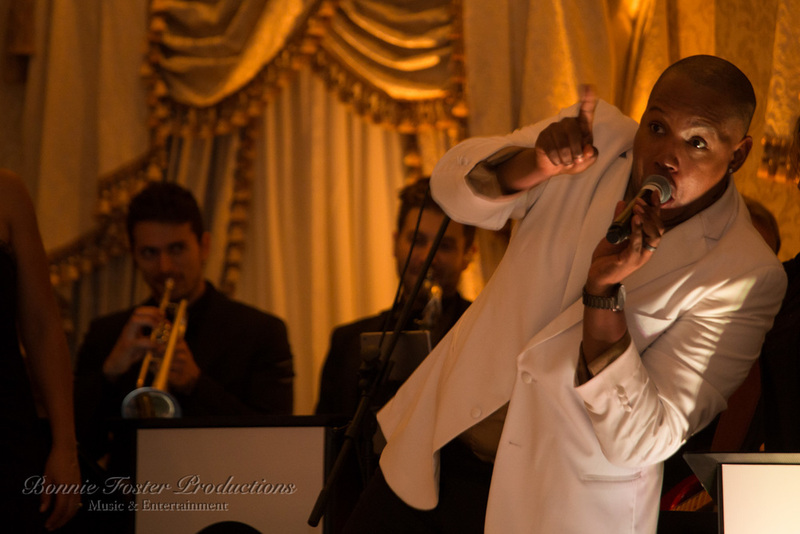 Watch the video below to see some of our best wedding reception music highlights including the John Legend smash "All of Me," Latin dance hit "Bailando," and a spirited version of "I Gotta Feeling" after the bride's awesome stage dive into the crowd. 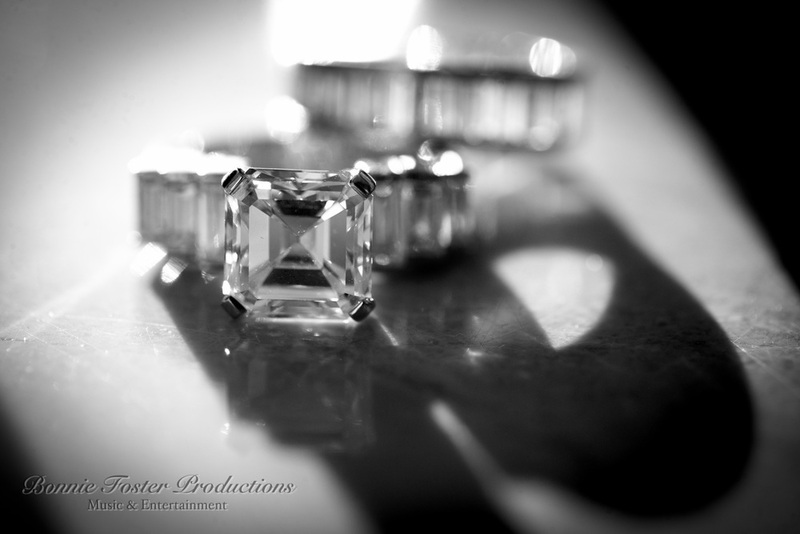 Bonnie Foster Productions was honored to collaborate with Wayne Foster Entertainment for a glamorous red carpet event at the Hollywood Museum in Los Angeles, CA. 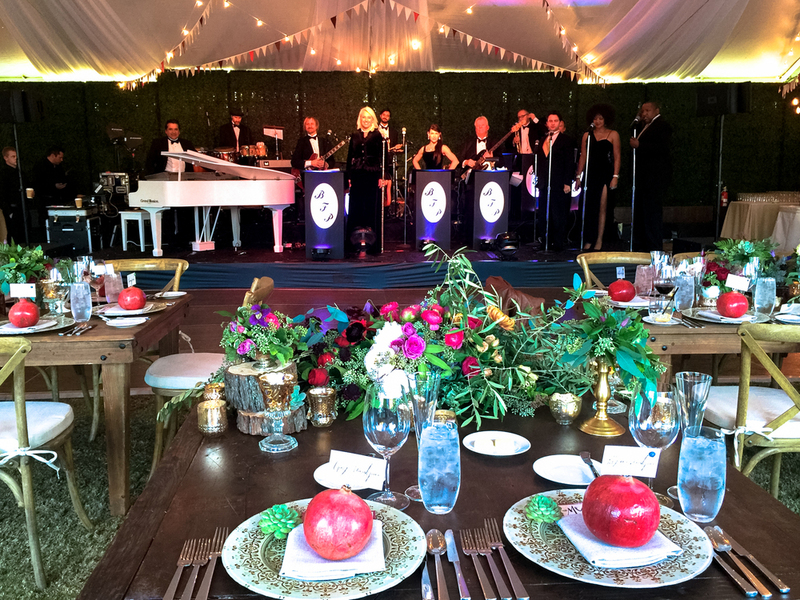 Our 20-piece variety band performed classic dinner music and a high-energy retro dance party mix of continuous music that kept this crowd groovin’ all night long. 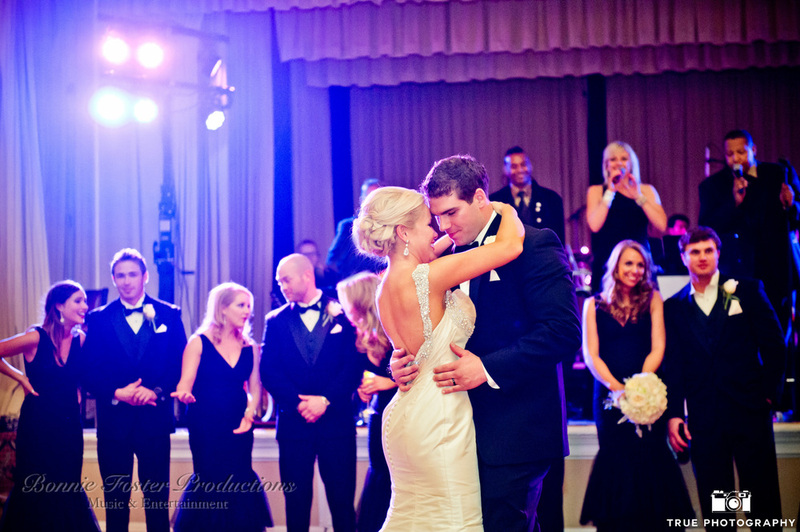 Jennifer + Tim are a super fun couple that know how to throw a party! The ceremony was held on the bluffs of the Palos Verdes Peninsula at the luxurious Trump National Golf Club, and the reception began as the sun set over the Pacific Ocean. 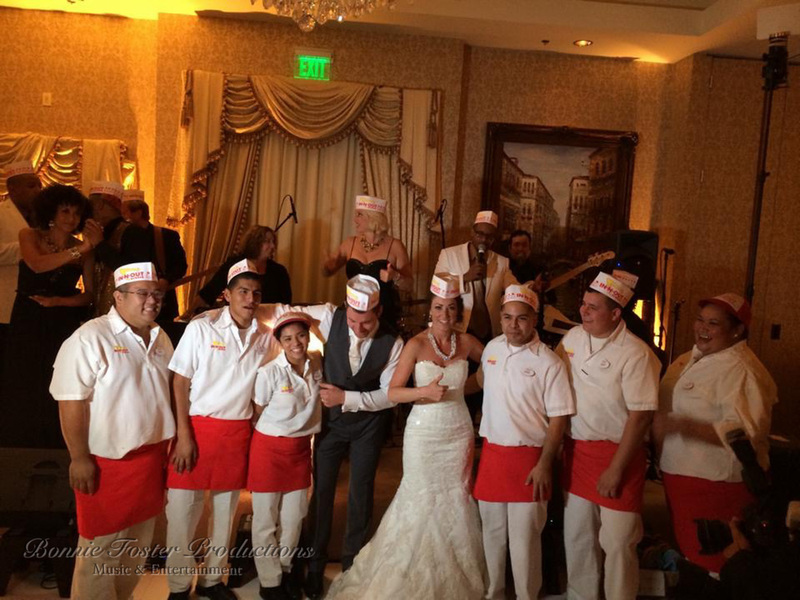 This couple met while working on cruise ships and had a great time getting down on the dance floor with our 12-piece dance band. 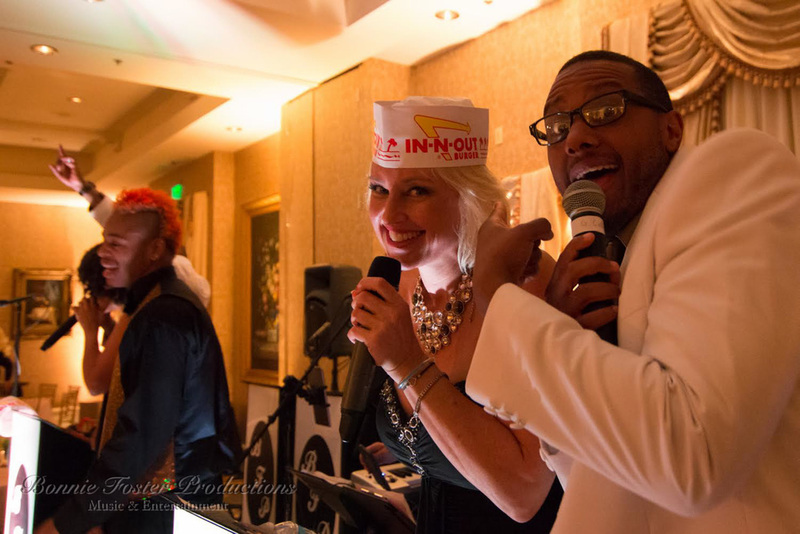 For the after-party, a huge In & Out Burger truck served up custom orders of their famous burgers to all guests for a perfect, savory late-night snack! 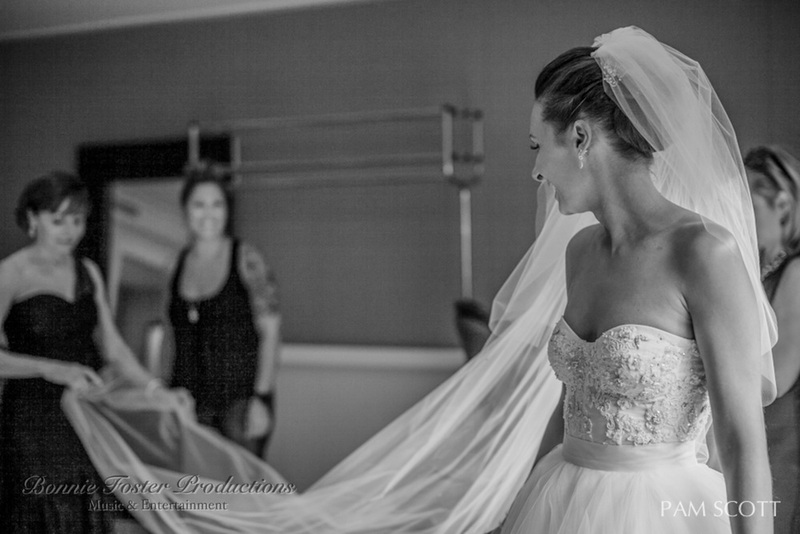 Watch video highlights from the reception below! 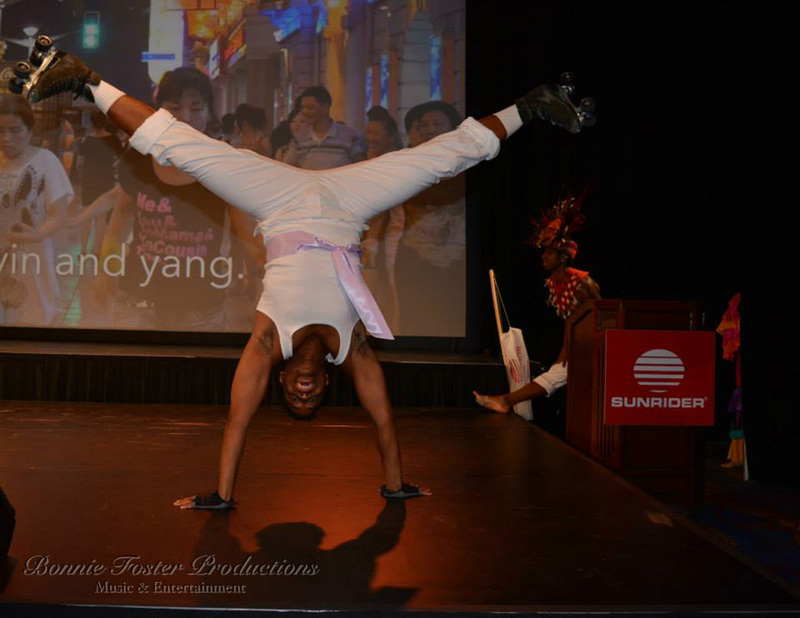 Bonnie Foster Productions had the opportunity to produce, choreograph, and perform original music and entertainment for the Sunrider International IBO Grand Convention July 10-14, 2014 at the Disneyland Hotel in Anaheim. Watch the video below! 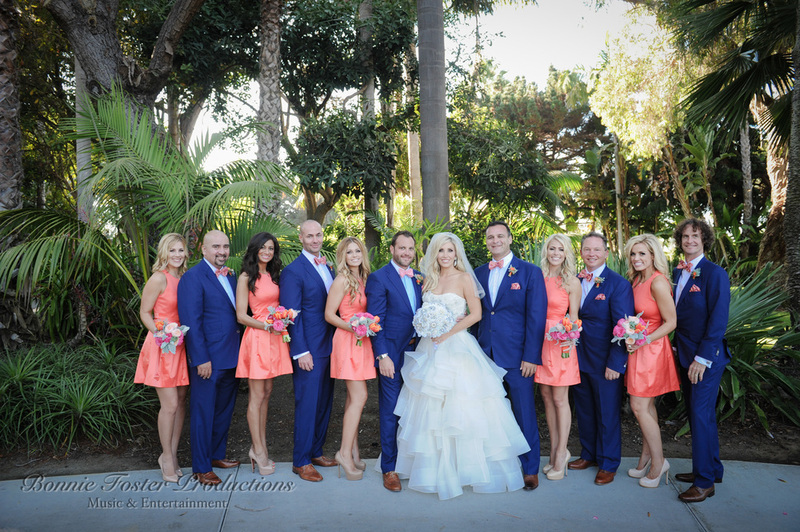 Jaclyn & Austin - Austin is a Navy Seal who had just returned from the South Phillipines to marry his stunning bride for a classic Coronodo Wedding by Victoria Schroeder at the iconic Hotel Del Coronado. With his fellow Seals in attendance, the wedding party and their guests enjoyed a beautiful reception overlooking the Pacific Ocean set to some of their favorite music including Brad Paisley’s “She’s Everything” for their first dance. Hazma & Elaaf - Every girl dreams that one day she will meet her prince, they will fall madly in love, and he will sweep her off her feet to live happily ever after in his beautiful palace. For this lovely princess, dreams really do come true! 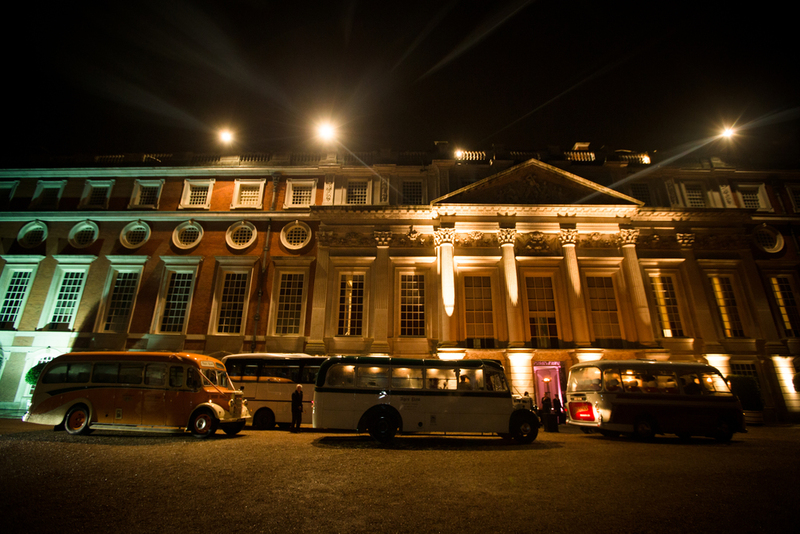 Hazma & Elaaf shared a spectacular evening under the "stars" with live entertainment at the historic Hampton Court Palace in London, England. 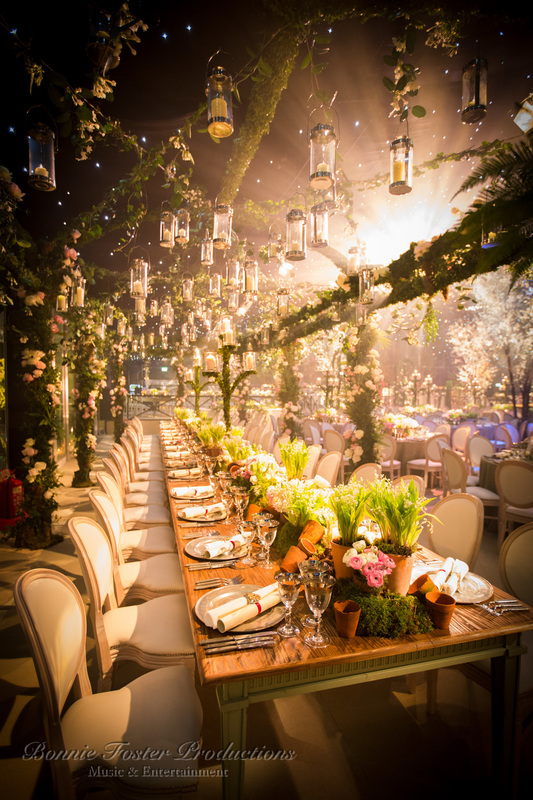 We were delighted to travel across the pond for this enchanting celebration fit for a King! 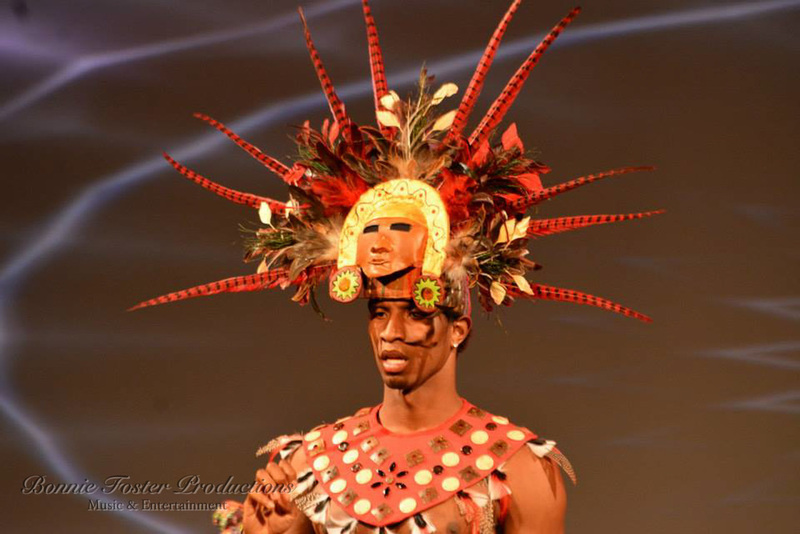 Thanks to Filmatography for capturing these stunning photos of the event! 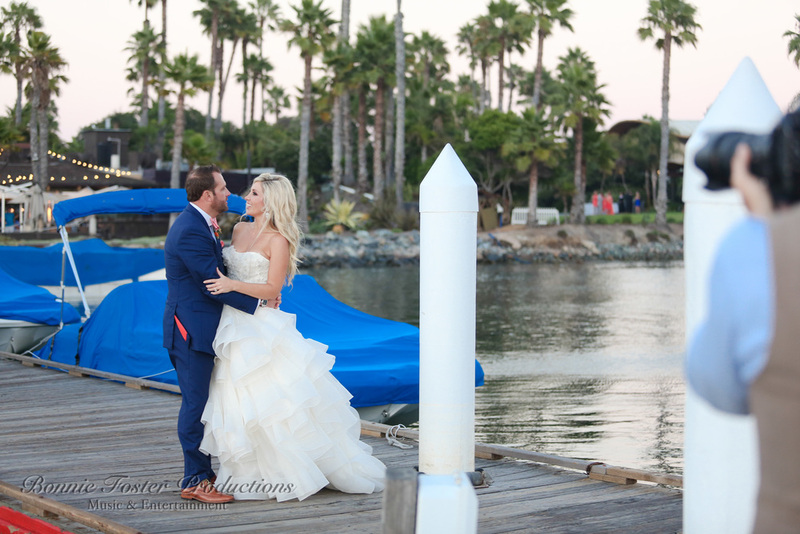 Heather & Chris launched their new life together with a sparkly Las Vegas inspired wedding by Styling Starts Here at Paradise Point in San Diego. 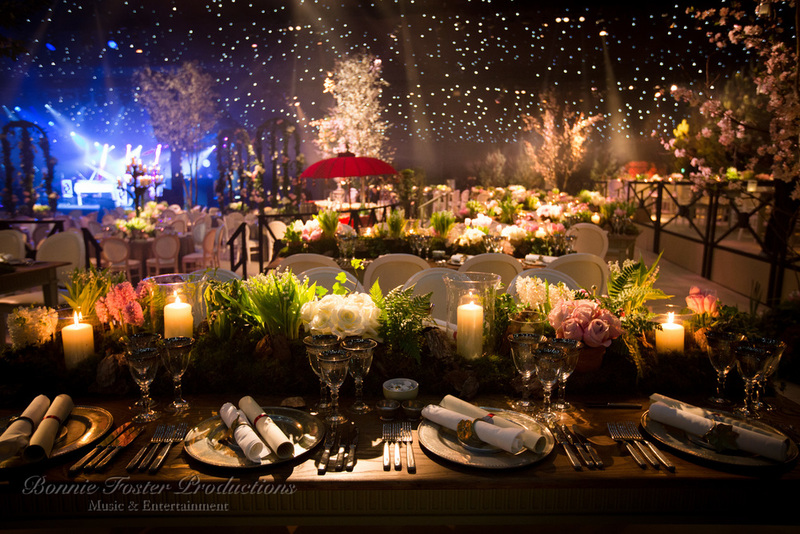 Chris, who works in the entertainment industry, knew he wanted to throw a fun party. 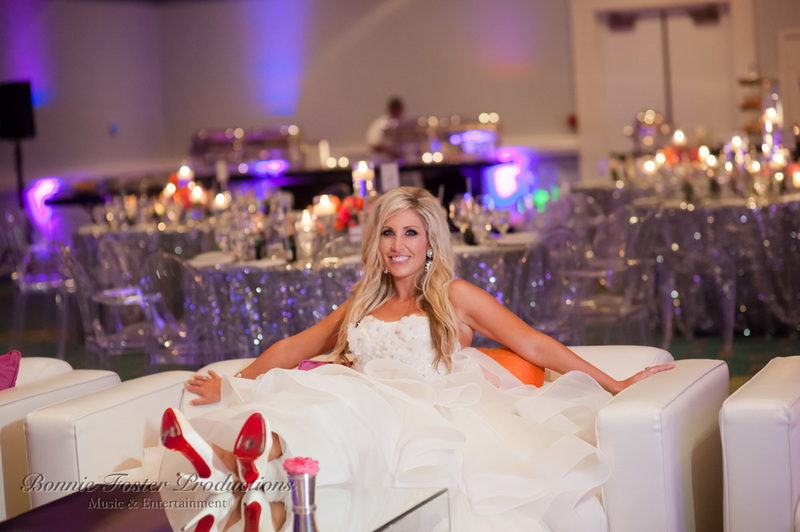 His new bride, Heather, started out the evening in a gorgeous tiered gown and surprised everyone with a wardrobe change for the wedding reception into a glitzy white party dress. BFP provided a steel drum player for their gourmet beach casual cocktail party the night before the wedding and a DJ for the beach brunch the day after the wedding. 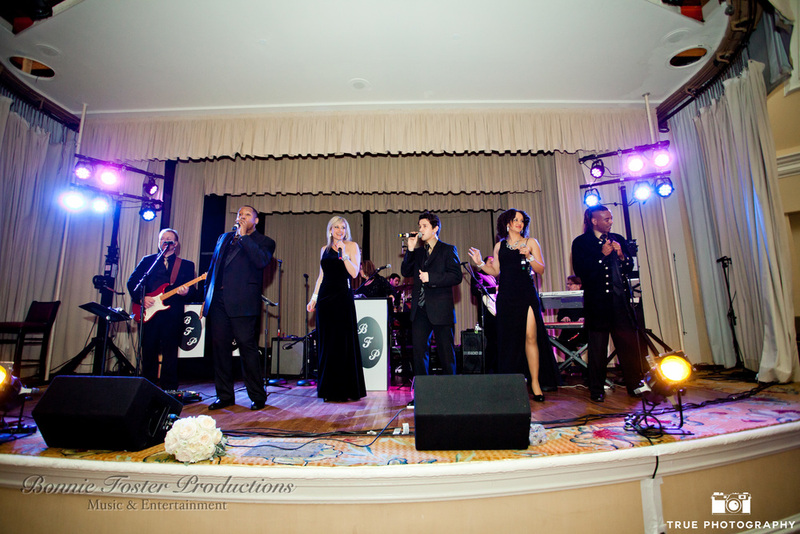 We had a 12-piece wedding dance band that rocked the house with everything from classic to contemporary hits for their reception. They ended the evening with a bang by handing out sparklers to guests.